Do you find yourself wishing you had time to take a serger sewing class, yet never finding the time? Solution: Take a serger technique workshop at home. 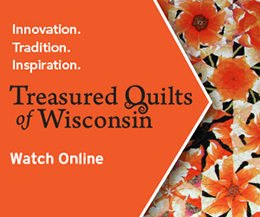 Watch Sewing With Nancy online! It’s a 2-part workshop with Nancy’s guest, Pam Mahshie, Baby Lock’s National Sewing Ambassador. Here’s a preview of the second episode. With just a few changes, the basic overlock stitch can be modified to stitch binding on a quilted project. Learn how fusible thread streamlines the sewing process, producing professional results. If you’ve gathered fabric before, you’ve probably stitched a row or two of basting stitches and then pulled the threads to gather the fabric. Gathering on a serger with a cover stitch can be automatic—stitch and gather at the same time. Curious? Learn now by watching online! Create texture with pintucks, again using the cover stitch setting. Light to medium weight fabric can easily take on dimension once you know how to set up your serger. Decorative threads and your serger are a prime choice for embellishing. The amazing part of this technique is that the stitching is done from the wrong side of the fabric—the pretty part only shows once the stitching is complete. A Serger Workbook with 33 Serger Techniques! Several seasons ago, Pam and Nancy presented a three-part Sewing With Nancy series simply called the Serger Workshop. The Ultimate Serger Techniques Workbook spiral bound book combines the information from this series. Learn 33 techniques using 10 different serger stitches! Now is your chance to win this workbook by leaving a comment telling us a serger technique you’d like to try. One winner will be selected randomly and announced on November 8. Watch Ultimate Serger Techniques on Sewing With Nancy online. I would like to learn to use my serger for thing other than finishing off edges and hems, especially some embellishments. I already do my quilt piecing with my serger and I’m curious to try the binding technique also. I got my serger for college graduation and have used it for more than 20 years but only for very basic things. I’d LOVE to win the set so I can get the full use of my favorite sewing machine! I have had my serger for about 4 years and wished I had the courage to get it out and try to use it but I am very intimidated by it. I would love to have some basic instructions and move onward and upward from there. I have seen what others can do with these machines and I am in awe and I would one day love to be able to do what they can do. I just need help with some good instructions. I would love to learn how to use the overlock stich to stich binding on my quilts. I would enjoy learning all that sergers can do! I especially want to learn the rolled hem and how to do curves. I like scarves with the beautiful rolled edge. I would like to learn how to do more than just finish seams with my serger. I am new to serging and my serger pretty much intimidates me! There is so much I need to learn, but I would really love to learn embellishing with decorative threads. Learning how to gather with a cover stitch would be my first lesson. Since I have 4 granddaughters, ruffled things are a must. This would be the best technique for me. I would truly enjoy using this book. Thanks for the opportunity to win it. I only use my serger for finishing seams and hem edges. I am sure this book would help me learn other techniques. What a fantastic workbook! I don’t use my serger to its fullest potential and need to improve my serger skills. Quilt binding using a 4-thread overlock stitch is the first technique I would like to learn. Oh, the pintucking would be so beautiful in white on white! Would love to have the book! You can’t know everything. Would love to be more comfortable with my coverstitch machine. I don’t use my serger! This book may give me the oomph needed to start. The decorative stitching looks intriguing. Would love to have this book, do not use my serger to it’s potential. Love to make gifts for family and friends. I need to learn how to make a rolled hem. I’m afraid to make any changes to my serger because every time I do the stitches get all wonky and I have to drag it back to my sewing store to have it reconfigured. I bought my serger long ago and rarely use it because of this. Its a sad state of affairs. Embellishing with Decorative Thread. Thanks. I would love to learn new decorative techniques and use my serger to the fullest potential! I am retired and have 4 grand daughters. I would love to learn new decorative techniques and use my serger to the fullest potential! It’s so difficult to choose just one. I would really love to learn how to gather with my serger. It would make it so much easier. Would love to learn other serging techniques as well. I would love to learn establishments of any kind as I have two granddaughters to sew for. It would be fun watching their eyes light up over the pretties Nanna made for them. I would like to try pearl cotton and some of the “jazzy” metallics in loopers but get nervous. Also got a foot for elastic but hesitate on using it. Quilt binding and decorative stitches!! And everything else! I’d like to try binding a quilt and decorative stitches among other things. I use my serger for the basic straight stitch. I would like to learn all the possibilities my serger is capable of. I would like to learn how to embellish with decorative thread. I have a new Babylock and would love to learn how to do the Wave Stitch. Also learn how to do quilt binding. I want to try gathering with the coverstitch. I know nothing about my serger. It just sits in a box and mocks me every time I look in it’s direction. Just got a new Baby Lock serger. Would be a great resource for learning. I would love the help of this book. I haven’t ventured past a basic overcast seam finish. I would like to try the embellishment threading on a scrap quilt to make it really stand out. So happy to see this tutorial. I have had a serger for quite a while but have not used it because I am still intimidated! This would help me a lot! I would like to learn about the quilt binding and other techniques since I am new to serging. I am curious about the quilt binding. I am a new serger owner so I can use help on all techniques. This book would be so helpful to learn of what my serger can do besides the regular 4-stitch and the cover hem. I would love to learn how to do the quilt binding, it is the least favorite part of making a quilt for me. Pam is the best instructor I have ever taken a class with. I would love to learn more ways to use my Serger. I would love to learn all of the techniques. I would like to learn how to do the 3 Thread Rolled Hem. Nancy always makes it look so easy! I love her hints and tips. Binding with the 4 thread overlock looked very efficient and time saving. I prefer to review books for reference and visual techniques. Most of all I would like to learn more about decorative threads and stitches. But anything i could learn would need just wonderful. Thanks for the opportunity to learn more! I would love to try the coverstitch on my activewear. Would love to learn how to serge specialty fabrics like ripstop nylon. I’m a mountaineer and love making my own gear. I want to make my own tee shirts . And some day learn to embelish my clothing with my serger! I would like to try the cover stitch with some beautiful thread I have been saving. Would like to learn more about serger techniques in regard to quilting. I would love to try the binding with the fusible thread. I would also like to try the gather stiches but I have a very basic serger and I cannot disengage the blade so its not possible with my current serger. Must be time for a new one! I would love to learn how to do pintucks and serging a quilt. I never would have imagined using my serger to create pintucks, but what a great idea! I definitely want to try this. I would really like to try quilt binding with 4 thread overlock. I would be interested in binding a quilt with my serger. As long as it is doable with a 4-thread serger. I don’t have one that does a cover stitch or any other fancier stitches. I would love this book! I’ve used a serger for years but other than regular serging and narrow rolled hems, I haven’t done any other thing with my serger. So many things to learn and explore! Thanks for the opportunity! I have a simple serger and have used it to entirely make lots of clothing, but some of the techniques that you have mentioned would be really fun to learn! Maybe I even need a serger that can sew coverlock stitches too. Would love to win this book and learn how to use the serger to bind the quilts that I make for mission projects. Would love to win this book and learn to use my serger to its full potential. I make many quilts for missions and would love to learn the serger binding as it would be faster than what I am doing now. I’d love to know how to sew on binding with a serger. I love learning new things. I have a serger and use it for serging edges and cover stitching but would not have thought of using it to bind a quilt. Fantastic! At age 78 it’s never to late to learn new techniques. I still haven’t mastered my serger that I have had for several years. I am still “afraid” of it. This book would be helpful to get me going. I would dearly LOVE to be able to learn to use my Serger to full potential! I would like to try the Cover stitch as you can do at least two things with it- gather and pintuck. Then I would like to learn all of the rest of the techniques! My Serger needs to be “put back on the table” and used for more sewing! Pam and Nancy make me feel like I can actually accomplish this and use my serger to it’s full potential. I would like to learn quilt binding using the four thread overlock stitch. I have a serger but have not used it. I love my serger, and have so many things that I would like to learn how to do with it. The one thing that jumps out ahead of the others though is the wave stitch, followed by the hem stitch and the cover stitch. I would love to learn them both. Thanks ever so much! Having just got a new serger , I would love to learn how to bind a quilt on it. I would love to learn pintucking and gathering techniques. I have had a serger for many years and want to use it more. I love my babylock serger/cover stitch machine – like most, I don’t use it to its max – having this book/dvd set would help me tremendously- great reference and how to guide! I would like to learn how to do pintucks and gathering. I would like to learn how to do quilt binding using a 4-thread overlock stitch. I just got a beautiful Babylock Ovation serger and am looking forward to unlocking all of its possibilities. Would love to learn more about how to use my server! Just use it to finish seams. I would love to own this book to enhance my serger skills! I don’t have a serger at this time, but have asked for one for Christmas. Hope to learn all of the different things I can do with a serger. I’d like to learn how to use the cover stitch for making decorative stitching. I would like to learn how to gather with a coverstitch.